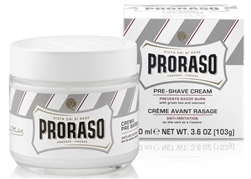 Proraso pre-post sensitive shave cream from Italy. Use to soften whiskers prior to lathering up with shaving soap or cream to enhance beard softening for even the toughest beards. Can also be used after shaving as a moisturizer. Contains oatmeal extract and green tea to protect sensitive skin. Comes in a 3.6 oz. (100 ml) glass jar.